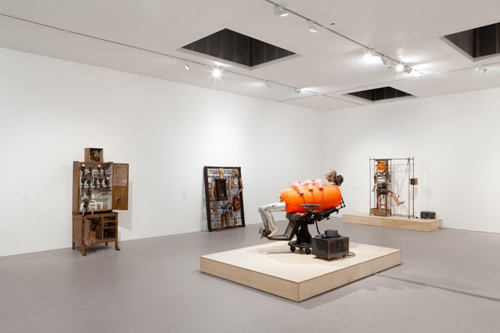 View of “The Bruce Lacey Experience,” 2012. A gloriously ramshackle affair, “The Bruce Lacey Experience,” curated by David Alan Mellor and Jeremy Deller, celebrates one of Britain’s most eccentric artists. The show is organized around an explosion of objects, ephemera, and films from Lacey’s five-decade-long career as an outspoken provocateur, bricoleur, performer, sculptor, and key figure on the London countercultural art scene of the 1960s. Amid the muddle of automatons, costumes, paintings, and footage of Professor Lacey and his music-hall sidekicks the Alberts emerges an artist who is, by turns, visionary, angry, and very funny. The exhibition is broadly chronological in format, moving from Lacey’s early figurative paintings made after he graduated from the Royal College of Art in 1954 through his assemblage works from the mid-’60s, and proceeding to various objects and paintings relating to the pseudo-tribal rituals that he has increasingly engaged with since the 1980s. The largest gallery contains a series of his junkyard robots. These six-foot-high mixed-media personages are made from old cogs, electrical circuit boards, mannequins, bicycle chains, and sections of piping. Included are The Womaniser, 1966, an inflatable orange cylinder-humanoid strapped to a dentist’s chair; Old Moneybags, 1964, designed to spring into action when the viewer screams into the attached microphone; and the red-lipped Rosa Bosom, 1965, winner of an Alternative Miss World competition in 1985. Lacey has consistently downplayed the seriousness of his work. But political commentary looms large here, and his assemblages appear as much reflections of a Cold War technocracy as they do witty instances of a postwar aesthetic of recycling and making do: In 1967 Lacey’s Vietnam Environment was installed at the Roundhouse in London as part of “Angry Arts Week.” When asked to describe his work, Lacey says he is simply “playing silly buggers,” but this statement belies a worldview that is, on the contrary, committed, radical, and deeply invested in an examination of life’s absurdities: Humor in Lacey’s hands is used not as a mask but as a weapon.